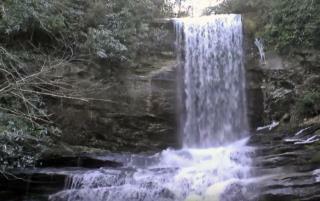 (Newser) – A man who apparently slipped from the top of a waterfall in North Carolina is dead along with his would-be rescuer. Authorities say Joseph Hopkins, 23, and Davis Zinsenheim, 22, were visiting a resident of the Lake Toxaway area from Georgia on Tuesday when they decided to explore a waterfall on the property. Authorities say three people were at the top of a waterfall when Hopkins fell some 40 feet onto a ledge. Zinsenheim tried to help his friend but slipped and fell an estimated 150 feet to his death, reports the Asheville Citizen Times. Should they rename it Dead Man's Falls or Dead Man's Falls Falls?